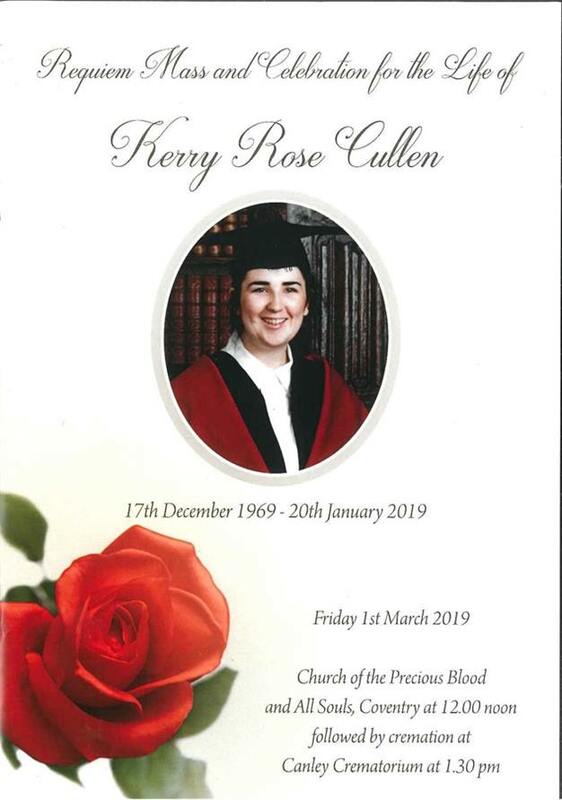 The Cullen family would like to express their sincere thanks for your expressions of sympathy & kindness received in their very sad bereavement. Instead of flowers the family kindly asked for donations to benefit Coventry Cyrenians, a charity for the homeless and lonely, which was a cause close to Kerry’s heart. Collection boxes were provided at the church and crematorium. Donations totalled £460.66 which we were extremely grateful to receive. Kerry was born in 1969 and during her life she gained a BA (Hons) in Humanities and taught Sociology and Politics, later gaining an MSc in Social Science Research (Race and Ethnic Relations). After meeting her husband Simon moved to Coventry and had the large family she had always wanted. She began working for the ICARG, forerunner to the CIS (The Coventry Irish Society), with one assistant. They were situated in the Koco Building in the Butts in Coventry and ran the organisation from there. From little acorns great oaks grew. Due to the hard work and diligence at fundraising the society grew and prospered moving to Hill Street where CIS became very successful and hit the heights. In its heyday, Kerry always said the CIS was her baby. Kerry had little regard got money or possessions and status, but stored value in people who demonstrated kindness and empathy. She divided people into ‘dolphins’ and ‘sharks’ – sadly, she ran into a few of the latter in the brief life.